There is so much jazz going on at the Atlanta Jazz Festival, which begins Saturday in Piedmont Park, that one stage couldn’t hold it all. Though we’ve been talking about all of the Mainstage Acts (We still have to cover Monday! 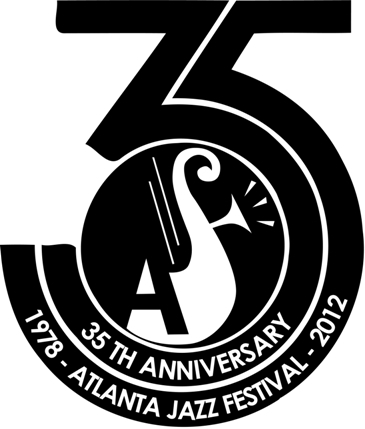 ), there are a lot of terrific albeit lesser-known artists performing on the Atlanta Jazz Festival International Stage. Many of these artists are based in the Atlanta area. These performances will be going on simultaneously with the ones on the Mainstage, so you will have to choose. But either way you’ll win with some great jazz. Among the International Stage names that caught my eye were trumpeter Melvin Jones, who made a big impression during last years festival as he backed singer Audrey Shakir; Saunders Sermons is a very fine vocalist/trombonist; Ernest “EC3” Coleman; a hard swinging drummer and Mace Hibbard, a strong saxophonist. Now that I look at the lineup, the International Stage would make for a damn fine festival, all by itself. I’ve dropped the complete International Stage Schedule and a few video clips below. Check the clips out, then if you’re at the festival this weekend drop by the International Stage and check these artists out. You’re in for a pleasant surprise. For more info on the individual artists, click on their names to access their websites or Facebook pages, where available.